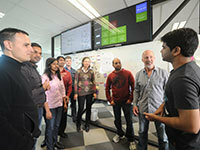 ITx 2014 kicks off with a road trip-style field trip of site visits, visiting some of Auckland's leading innovators and tech attractions and concluding with refreshments at MIT's new state-of-the-art multi-million dollar campus. The ITx Innovation Tour is made possible due to the kind support of AppSense, a leading provider of user virtualization, workspace and desktop management technology solutions. Places are strictly limited. Please email events@iitp.org.nz to secure your place. WHERE Buses leave from the Rendezvous Grand Auckland at 1:30pm sharp - don't be late! COST FREE for all ITx attendees, but places are strictly limited. Registration essential. INCLUDES Chartered luxury bus travel from/to Rendezvous and between visits, afternoon tea, plus drinks and nibbles at MIT at the end. The University of Auckland's Computer Science Department is home to the New Zealand computer timeline, with hundreds of historic computers, equipment and documents on display. 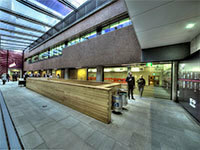 The new display was launched by the University in association with IITP in November last year. Professor Bob Doran and other University staff will host a tour of the timeline and displays. 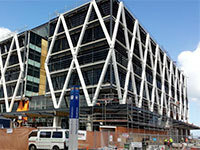 Acquiring Banklink last year saw a coming together of two businesses making it the second headquarters after Melbourne. The company has adopted the ‘lean start up’ or ‘agile’ way of doing things and that requires a greater emphasis on workspaces and features such as the ‘agile walls’ that allow development teams to be creative and discuss ideas. 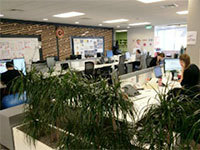 The multiple TV screens and web-cams assist in better collaboration with peers in other parts of New Zealand and Australia. It is colourful environment, with recreational spaces that include a table tennis table and pool table, a large café-style lunch area and a variety of workspaces with the option of "stand-up" desks for all staff. Take a tour and see Agile done right. Founded in 1992 by Ian McCrae and colleagues, Orion Health has built up to become New Zealand's largest software exporter with 23 offices globally and more than 1000 staff. Hear from Orion's senior management on the secrets to Orion's success, and take a tour around their state-of-the-art development environment. Manukau Institute of Technology (MIT) have recently opened their new campus with themed floors, natural light and technology abound. MIT will host a tour of the new facility with state of the art technology. The tour concludes with refreshments at MIT before heading back to the Rendezvous hotel (back between 6:30pm and 7pm). Registration is essential. Please contact events@iitp.org.nz to secure your place.